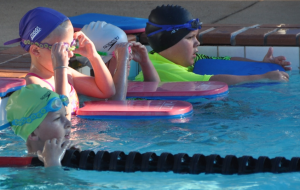 "the Pool at the School"
The Wizards Swim School @ Bracken Ridge offers a comprehensive and structured Learn to Swim program operating six days a week. Each participant is graded into levels according to their individual skills and abilities. Prior to moving to the next level a defined set of proficiencies will need to be demonstrated. Free assessments can be booked by contacting the office. To find out more about each level, click on the Links in the left side bar. Learn more by following us on Social Media or just send us an e-mail. We are an AustSwim accredited Swim School. We are a Junior Dolphins Club. Copyright © 2019 Bracken Ridge Swimming Club Inc.